The Rexall sign on the Bowman Drug store catches my eye every time I pass by it. I only wish the weather had been better this time. The skies were threatening the whole time, but I still enjoyed walking around this friendly little town, with its antique dealers and quaint old storefronts. 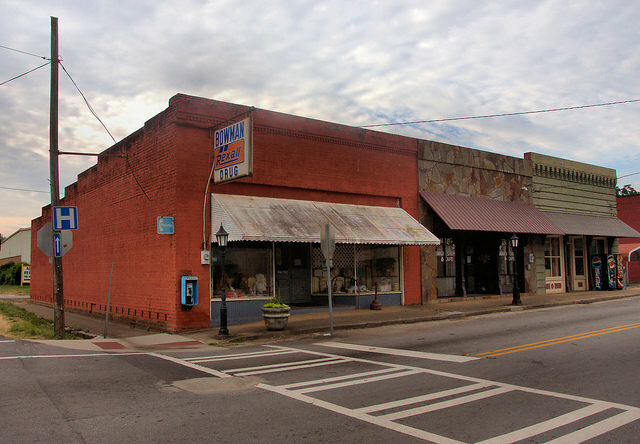 Bowman was incorporated in 1907 but its origins date to the late 1870s, when a road connecting Elberton and Toccoa was cut through the area. Subsequently, a depot was located here and named for Colonel Thomas J. Bowman, who had surveyed the land. Wow…I spent my first 19 years there and never knew the origin for the name Bowman!! Brian, your work/artistry is so incredibly fine. They provide me with joy in my dull life. Thank you, Hannah! You are so kind, as always. Brian – I can’t believe you didn’t do a 180 where you were standing a get a picture of the Bowman Police Department. Very unique!